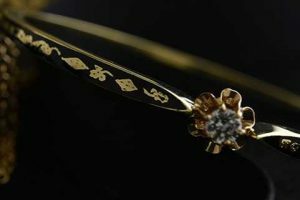 Not all the treasures at Joden are hidden in Joe’s Special Box, in fact, our crowning glory is in the store for all to see. We have one of the largest collections of the work of Carlo Giuliano in the country. 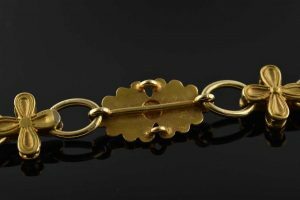 Giuliano was the favored jeweler to Queen Victoria. 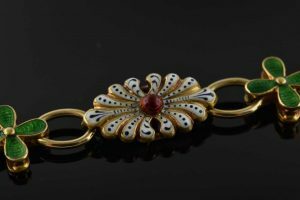 His elaborately enameled creations are widely considered to be some of the finest pieces in all of jewelry history. 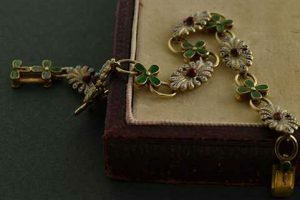 At Joden, we are curators of the past – cultivating passion for this lost art. Most of the exceptional examples from the life and work of Carlo Giuliano feature striking enamel patterns – most notably crisp black and white designs like the one shown here. Careful consideration should be given to how very precise the tiny dots are… not once do they fade into the white background. Never before and never again was this process able to be duplicated – it is exclusive to the Giuliano firm. 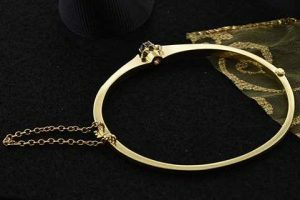 When this bracelet made it’s way into our store last week, every one of us was certain it was Giuliano. We searched every link for the classic Giuliano trademark… never to find it. There is not one single hallmark anywhere to be found on this Art Nouveau beauty. Is it un-signed Giulanao? Joe’s theory is that it was made by an apprentice… a young artist learning the art of the master. 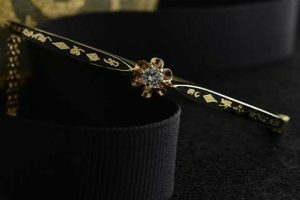 In any case, this bracelet is in pristine condition and is absolutely stunning. It’s available now for $8800.00. It’s Good Friday. For all of Christianity, this is the anniversary of the crucifixion of Christ. The ultimate sacrifice – Jesus was tortured then hung on a large cross. According to legend, the cross was made from a dogwood tree. Contrary to that, other sources claim that the true cross was made from three types of wood: cedar, pine, and cypress. 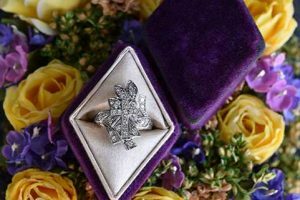 No matter what it was made of, there is no question that for the nearly 2000 years since the cross has become the principal symbol of the Christian faith. At first glance, I thought this was just a diamond cluster ring. Only upon closer inspection did I see the cross in the center of the piece. 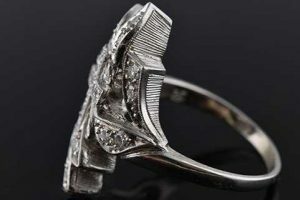 Made entirely of 14 karat white gold in the 1960s, this ring is perhaps one of the most unique representations I have seen. 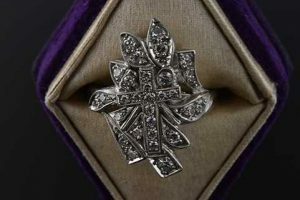 The cross is one of the most widely used symbols in jewelry, but more often than not, it is a pendant. Silver or gold, enamel or mosaic… we have hundreds of them. This ring, however, is much more unusual. 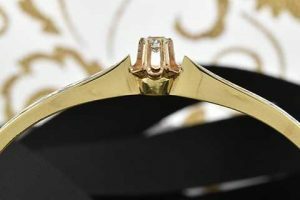 It’s a free-form burst, complete with thirty single cut diamonds that sparkle and shine from every angle. 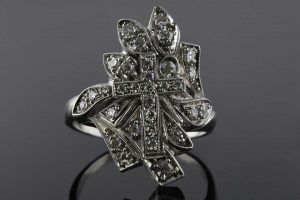 These diamonds have a combined total weight of approximately 1.00 carat and are fine quality – bright and eye clean. 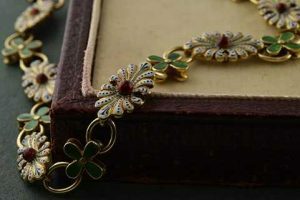 Each line and curve features a millegrain edge (tiny little beads of metal) creating a decidedly Art Deco feel. It’s quite lovely and moderately priced at $1,750.00. At Joden, we strive to choose pieces that are more than rocks and metal. Each one is hand selected with an eye for style and a passion for quality. We hope you enjoy them as much as we enjoy selecting them for you.